Fall at the beach is gorgeous. Breezy, sunny, and the daily summer showers aren’t *as* guaranteed. You’ll feel the wind in your hair on the boat ride, and very minimal sweat! When you plan a fall beach trip you’ll be one of few families taking the time to do so. Summer is prime time for tourists, and fall is prime time for a relaxing crowd-free trip! 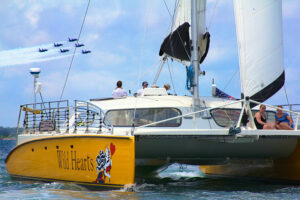 Our Dolphins and Blue Angels sail is a great excursion and we have plenty of fall dates scheduled. On this cruise, you’ll experience tons of marine life on the boat ride to Pensacola, as well as a provided breakfast. We anchor in front of the haunted light house, then relax as we wait on the Blue Angels to give us a show. As always, be sure to check our website regarding possible date and time changes. We can’t wait to see you this fall on one of our dolphin excursions!